Beartooth Front landowners last week filed the critical brief in their lawsuit against the Stillwater County Commissioners. It outlines their argument for why landowners alone, without the approval of minerals owners, should be able to establish a citizen-initiated zoning district. The argument lies at the heart of a central tension in Montana law: the self-determination of landowners to decide what happens on their own property vs. the importance of mineral extraction to the state economy. The brief is a request for summary judgment, which asks Judge Jones to rule in favor of the landowners. It is written clearly in language that can be easily understood, and I recommend it to those who want to understand these issues in detail. The Beartooth Front Coalition is a group of landowners in southern Stillwater County who are attempting to set up a citizen-initiated zone to regulate future oil and gas activities. Their goal is not to stop drilling, but to make sure it is done in a way that will protect the long-term health of their community. According to Montana law, this requires the signatures of 60% of the real property owners in the proposed zone. The landowners submitted these signatures, the Stillwater County Attorney informed the landowners that they had cleared the hurdle of 60% of the surface real property owners, but then determined, without every notifying the landowners during signature collection, that 60% of the minerals owners were required as well. The landowners then filed suit to protect their rights. Sunset on the Stillwater River. 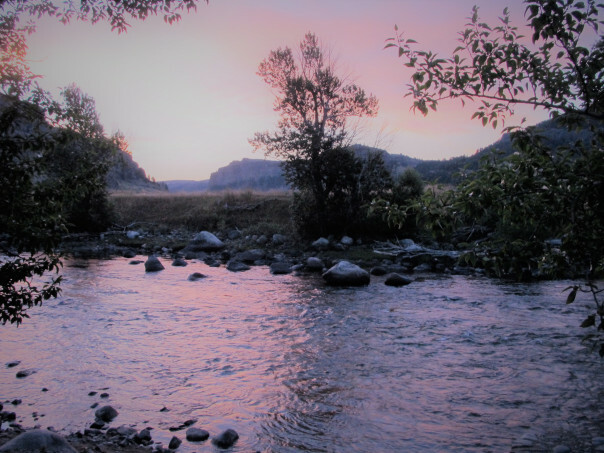 The River is the lifeblood of the local community, and landowners seek to preserve its long-term health. Photo by Anne Moses. If they are successful, the County will be forced to follow the law and hold a hearing on the petition. If the County is successful, the future of citizen-initiated zoning, a basic tenet of Montana law for the last 65 years, will be thrown into chaos. A review of the history of law and zoning in Montana makes it clear that the legislature intended that only surface landowners should participate in land use zoning and not minerals owners. A scheme in which minerals owners are included as potential signatories to a zoning petition is unworkable. This is something the County admits — they have no list of mineral owners with which to validate the petition, and the cost of obtaining such a list would be hundreds of thousands of dollars, an unreasonable hurdle for a group of petitioners. The judge should grant the landowners a writ of mandamus, an order for the County to validate the petition and hold a hearing on the zone as quickly as possible. In 1913, the County was formed when residents of the area voted to form a separate county from parts of Yellowstone, Carbon, and Sweet Grass counties. Before citizen-initiated zoning existed in Montana law, this was a clear statement by local residents that their unique needs required a distinct organizational structure that they controlled. In 1979, when the Stillwater Mine was a joint venture between Chevron and Manville Corporation, local residents formed the first citizen-initiated zone in Stillwater County to make sure that mining was done right, on the community’s terms. The purpose of the zone was almost identical to that of the current proposed zone: “…not to prevent particular activities, but rather to regulate and promote the orderly development of the area. The development of the area shall consider the health, safety, and general welfare of the people of Stillwater County.” It was a good idea then, as it is a good idea now. Read the West Fork Stillwater Planning and Zoning Ordinance. After mining began in 1985, local residents fought hard against the Stillwater Mine to protect the water and local communities directly impacted by mining activities. In 2000, the two sides worked together to negotiate an agreement to extend protections beyond state requirements to protect property, water, and area communities, while allowing platinum and palladium mining to proceed. The contract is legally binding and establishes a process for citizens to regularly meet with company representatives to address and prevent problems related to mining impacts, reclamation, wildlife, and other issues. The Good Neighbor Agreement has protected land with conservation easements, instituted a busing program to vastly reduce traffic on winding valley roads, and provided for independent environmental audits. While relationships have not always been smooth, this agreement is recognized nationally as a model for effective relationships between extraction companies and local communities. Read the Good Neighbor Agreement. What’s disappointing about all this is that the County is celebrated around the country for our accomplishments, but the current Stillwater County Commissioners have no apparent knowledge of any of this, and are not directly involved in the administration of the Good Neighbor Agreement. They clearly do not understand that self-determination is built into the DNA of the community, and successful partnerships are what we do. Quite simply, the Commissioners are not doing their jobs. They should be helping their taxpayers, who have decided overwhelmingly to form this zone to protect the long term health of their community. But rather than do their jobs and help us get it done, the Stillwater County Commissioners choose to align themselves with the oil and gas industry. Now it is up to the courts to decide whether they can get away with it. Assuming there are no extensions, the County will have 21 days to respond, and then the landowners will have 14 days to reply. That will put the end of briefings in early October. Our attorney has asked for a hearing on the motion, and we are hopeful that Judge Jones will conduct the hearing and issue a ruling on our motion before the end of the year. Do mineral rights have anything to do with citizen initiated zoning in Montana? This entry was posted in Legal and tagged Beartooth Front Coalition, citizen initiated zoning, Good Neighbor Agreement, Lawsuit, Stillwater County Commissioners. Bookmark the permalink. Seems like there is no better way to focus the minds of the Commissioners than to put them squarely between rocks (mineral rights) and a hard place (surface rights). It has been a few years since I read the statute on CIZ, but I don’t recall that mineral rights holders had veto power over the creation of a district. The statute says that you have to get the signatures of 60% of real property owners in the district. There have been 111 CIZs formed in Montana in the last 65 years, and every single one has interpreted “real property owners” as surface owners. The Stillwater Commissioners say that real property owners include mineral owners, and we have to get their approval too. Nice article David on the long history of protecting beautiful Stillwater Valley for all Montanans to enjoy! Thanks for such a great synopsis of the history and evolution of such a crucial issue.